L’Oréal Professionnel introduces Texture Expert: a new, ultra-premium styling line which treats and repairs the hair fibre at the same time. Aside from styling the hair to create very elegant and feminine looks, Texture Expert also penetrates deep into the hair fibre for conditioning and treatment. 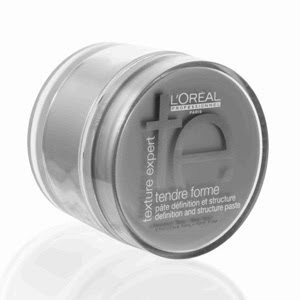 Texture Expert is a styling range which treats and repairs the hair fibre at the same time. The products feature several technologies which work both on the hair’s surface and deep inside the fibre. This styling line can create various, elegant looks, as the product acts on the hair’s surface for flexible hold, better control, and protection. Results: Instant root-lift, volume and lightness. Instructions: Apply 1 or 2 doses of the product on washed and towel-dried hair to add volume. Proceed with blow-drying or styling as usual. Technology: Incell and pearl proteins repair and reinforce sensitized hair fibres. Vitamin E acetate protects the hair. Results: Long-lasting shine with reflector system for a lustrous finish. Instructions: Spray from about 30 cm on dry hair. Description: Taming cream for thick, rebellious hair. Results: Instant volume reduction. Frizz control and long-lasting humidity protection for smooth, soft hair styles. Nutrition and softness. Product category: Blow-in treatment for thick hair. Main benefit: smooth, blow-dry styling. Instructions: Work a dab of the product into the palms and apply to washed and towel-dried hair. Proceed with blow-drying. Dry with diffuser to define curls. If needed, repeat application on dry hair throughout the day for added control. Technology: Incell and pearl proteins repair and reinforce sensitized hair fibres. UV filter and vitamin E acetate protect the hair. Tips: A small amount of the product is enough. Ideal for women with very thick hair who want some control. Results: Aqua-essence for a smooth blow-dry style or a hair style with a soft, lightweight finish. Main benefit: smoothing, blow-dry styling. Instructions: Apply a dab of the product on washed, towel-dried hair. Proceed with blow-drying or styling as usual. Description: Definition and structuring paste for fine hair. Results: Definition and texture for sculpted hair styles and flexible hold. Supple and soft hair without visible residue. Natural shine and hair structure. Instructions: Work a small dab of the product into the palms and apply to washed and towel-dried hair to add texture. For more definition, work in with fingers on dry hair. Tips: Ideal as a finishing touch on short, limp hair. Ideal for creating graphic, bed-head or mussed effects. A small quantity is enough, so it doesn’t weigh hair down. Effects are easy to rework. Description: Pearly nutrition wax for normal to thick hair. Results: Strand by strand control and definition. Flexible hold for shiny, sculpted hair styles. Instructions: Apply as a finishing touch to dry hair. Tips: Ideal finish for short hair. For creating smooth or bed-head looks. Perfect for layered, tapered cuts. Hair Styling products and it treats hair? That sounds hair heaven to me. Having had no experience whatsoever in hairstyling since I've been stuck with the same hair style all my life, I coudn't be more happier knowing there is a product out there that can give me a nice volume but without the damaging chemicals. Rather, Texture Expert is also a hair treatment that penetrates the fibre of the hairs to make it stronger and look healthier. I am personally in love with the Smoothe Ultime which maintains the softness of my very thick hair but at the same time has UV filter to protect it against the sun and infuses vitamin E for added healthy-looking shine. I apply it right after I shake off excess water after shower and let it airdry. I also see to it that my stylist uses the same prior to blow-drying my hair on special occassions. I top it of with Perfect Shimmer to provide me that hair commercial feel. Because of my heavily treated hair, I stray away from using products that are heavy but I found this line to be just the right amount of consistency to the point that its lightweight. This line is only available at selcted Salons. Ask the advice of your stylist for the best Texture Expert product for you.